This article is about the year 1700. For the music video show, see 1700 (TV series). Wikimedia Commons has media related to 1700. November 30: Battle of Narva. 1700 (MDCC) was an exceptional common year starting on Friday of the Gregorian calendar and a leap year starting on Monday of the Julian calendar, the 1700th year of the Common Era (CE) and Anno Domini (AD) designations, the 700th year of the 2nd millennium, the 100th and last year of the 17th century, and the 1st year of the 1700s decade. As of the start of 1700, the Gregorian calendar was 10 days ahead of the Julian calendar, which remained in localized use until 1923. As of March 1 (O.S. February 20 or 19 -), when the Julian calendar acknowledged a leap day and the Gregorian calendar did not, the Julian calendar fell one day further behind, bringing the difference to 11 days until 1799. In Sweden, the year started in the Julian calendar and remained so until February 28. Then, by skipping the leap day, the Swedish calendar was introduced, letting February 28 be followed by March 1, giving the entire year the same pattern as a common year starting on Monday. This calendar, being 10 days behind the Gregorian and 1 day ahead of the Julian, lasts until 1712. 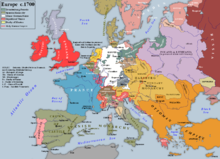 January 1 – Protestant Western Europe, except England, starts using the Gregorian calendar. January 1 (Julian) – The Tsardom of Russia begins numbering its calendar from the birth of Christ (Anno Domini), instead of since the Creation (Anno Mundi). January 26 – At approximately 9 p.m., the Cascadia earthquake occurs, with an estimated moment magnitude of 8.7–9.2. This megathrust earthquake ruptures about 1,000 kilometers (620 miles) of the Cascadia Subduction Zone and causes a tsunami, that strikes the coast of Japan approximately 10 hours later. February 3 – The 'Lesser Great Fire' destroys a substantial part of central Edinburgh, Scotland. February 12 – The Great Northern War begins with a joint invasion of Swedish territory in Germany and Latvia, by Denmark and Poland/Saxony. Sweden has control of the Baltic Sea and holds territory that includes Finland, Estonia, Latvia and parts of northern Germany. To challenge its power, an alliance is formed between Tsar Peter I of Russia, King Frederick IV of Denmark and Augustus II the Strong, King of Poland and Elector of Saxony. Sweden's ruler is the militaristic Charles XII, known as the "Swedish Meteor". February 27 – The island of New Britain is discovered by William Dampier, in the western Pacific. March 1 (Gregorian) – Protestant Germany and Denmark–Norway adopt the Gregorian calendar. March 1 (Swedish), March 11 (Gregorian), February 29 (Julian) – The Swedish calendar is adopted. March 3 - Shivaji II acceded to the throne of Maratha Empire as 4th Chhatrapati after his father's Rajaram I's death. March – William Congreve's comedy The Way of the World is first performed in London. March 25 – The Treaty of London is signed between France, England and Holland. April – Fire destroys many buildings in Gondar, the capital of Ethiopia, including two in the palace complex. May – In Rhode Island (American colony), Walter Clarke, three term former Governor of the Colony of Rhode Island and Providence Plantations, is elected deputy governor for the second time, serving under his brother-in-law Samuel Cranston. Within a few days of John Dryden's death (May 1 O.S. ), his last written work (The Secular Masque) is performed as part of Vanbrugh's version of The Pilgrim. June – Massachusetts, then New York, passes similar laws that order all Roman Catholic priests to leave their colony; otherwise, after three months, their penalty will be life imprisonment or execution. July 11 – The Prussian Academy of Sciences is founded, with Gottfried Leibniz as president. Summer – Charles XII of Sweden counter-attacks his enemies by invading Zealand (Denmark), assisted by an Anglo-Dutch naval squadron under Sir George Rooke, rapidly compelling the Danes to submit to peace. August 18 (August 7 O.S.) – The Peace of Travendal is concluded between the Swedish Empire, Denmark–Norway and Holstein-Gottorp in Traventhal. On the same day, Augustus II, King of Poland, and Peter the Great, Tsar of Russia, enter the war against Sweden. Late summer – A Russian army invades Swedish Estonia, and besieges the town of Narva. November 1 – Charles II, the last Spanish king of the House of Habsburg, dies insane at the Royal Alcazar of Madrid (aged 38), leaving no children. November 15 – Louis XIV accepts the Spanish crown on behalf of his grandson Philip of Anjou, who becomes Philip V of Spain (to 1746), thus triggering the War of the Spanish Succession (1701–1741). November 18 – Lithuanian Civil War – Battle of Olkieniki: The anti-Sapieha coalition is victorious. November 23 – Pope Clement XI succeeds Pope Innocent XII, as the 243rd pope. November 30 (November 19 O.S. ; November 20 Swedish calendar) – Battle of Narva, Estonia: Having led his army of 8,000 on a forced march from Denmark to Estonia, Charles XII of Sweden routs the huge Russian army. December 28 – Laurence Hyde, 1st Earl of Rochester, is appointed Lord Lieutenant of Ireland. Mission San Xavier del Bac is founded in New Spain near Tucson, as a Spanish Roman Catholic mission. The mission's location had first been scouted by the Spanish in 1692 according to most historians. An inventory made for the Medici family of Florence is the first documentary evidence for a piano, invented by their instrument keeper Bartolomeo Cristofori. An English translation of the novel Don Quixote, "translated from the original by many hands and published by Peter Motteux", begins publication in London. While popular among readers, it will eventually come to be known as one of the worst translations of the novel, totally betraying the spirit of Miguel de Cervantes's masterpiece. The value of sales of English manufactured products to the Atlantic economy is £3.9 million. Lions become extinct in Libya. ^ Colville, Ian (February 8, 2011). "The Lesser Great Fire of 1700 in Edinburgh". On this day in Scotland. Retrieved November 21, 2011. ^ Williams, Hywel (2005). Cassell's Chronology of World History. London: Weidenfeld & Nicolson. p. 289. ISBN 0-304-35730-8. ^ Hochman, Stanley. McGraw-Hill Encyclopedia of World Drama. 4. p. 542. ^ "The House Laws of the German Habsburgs". Retrieved November 21, 2011. ^ "US History Timeline: 1700 - 1800". faculty.washington.edu. ^ O'Connor, John J.; Robertson, Edmund F. (August 2004). "Berlin Academy of Science". MacTutor History of Mathematics. Retrieved November 21, 2011.